LAWRENCE – The third annual State of the College will be an opportunity for faculty, staff and students in the College of Liberal Arts & Sciences to interact with new Interim Dean Clarence Lang. Lang will build on previous years’ discussion on the College’s strategic plan, sharing progress on initiatives. 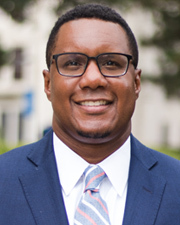 The plan lays out actions aimed at student success and opportunities for undergraduate and graduate students, scholarly and pedagogical support for faculty, professional development for staff and strategic growth for the College as a whole, with emphasis throughout on sustaining an environment that values diversity, equity and inclusion. Increased partnership with the College Advisory Board on critical areas including career readiness for students, research support and international opportunities. The State of the College also offers a forum for feedback, with the majority of time reserved for Q&A with attendees. The State of the College is open to the public. It will take place at 3:30 p.m. Sept. 26 at Forum D in the Burge Union. The event will be recorded and available for viewing following the event. The College of Liberal Arts & Sciences is the heart of KU. As the broadest, most diverse academic unit at KU, it is home to more than 50 departments, programs and centers, as well as the School of the Arts, School of Literatures, Languages & Cultures, and School of Public Affairs & Administration.